You know, when I get married I'm gonna wear a long white dress with a band of daisies in my hair and sparkly white shoes. I'll be the prettiest bride in the whole world. 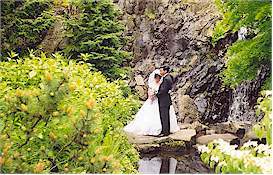 After the ceremony my husband (someone rich and handsome) and I will get our wedding pictures taken at one of the prettiest places I've know of - Queen Elizabeth Park. It has the perfect spot for pictures: a small bridge with a waterfall behind it. How romantic. There's also a sunken garden, which looks cool from the top, especially when you imagine you're Harry Potter swooping down into it on his broomstick. My favourite place though is the Bloedel Floral Conservatory - not because I love plants, but the birds in there are really neat. They have some exotic ones I've never seen before. Mom and Dad of course, like doing the boring stuff. I mean who wants to look at the picturesque view-even if you are 500 feet in the air and can see all of Vancouver, plus the North Shore mountains. Anyway, once you get past the viewing area, there's still lots to do at Queen Elizabeth Park: pitch and putt golf, Frisbee golf, have a picnic, or do what Coleman likes to do - chase the ducks in the duck pond (which is a no-no). Dad says you have to be at least 25 years old to go to Queen Elizabeth Park. He must be joking, because I'm 9 and Coleman is 3, and nobody has asked us for I.D. If you're looking for a cheap outing, Queen Elizabeth Park is the place to go. 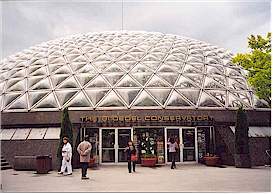 It's absolutely, positively free except for the Bloedel Conservatory, which costs only $3.50 for adults and $1.65 for kids. 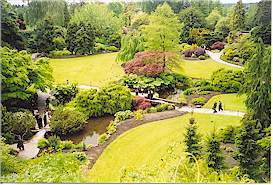 If you like looking at gardens you should definitely go to Queen Elizabeth Park. We took my Mom's aunt and uncle from Holland there and they said it was, in Dutch, "prettige" (that means beautiful). When you get bored of looking at flowers and shrubs, you can head over to the grassy slope facing Cambie Street and play tag or have a BBQ. My biggest beef with Queen Elizabeth Park is that it's a lookey-lou type of place. You can't just turn your kids loose in there. It has paths you need to stay on, and you're not allowed to pick the flowers. One other small problem that may not even be a problem in your family (but it was in ours) is that your parents may start to argue on the way home. I overhead Mom say, "Maybe we should hire a gardener to clean up our mess." Dad made the mistake of saying, "We don't need one - you have lots of time to do it." You can pretty well guess the rest. I guess you could walk around the park in the winter, but it wouldn't be as pretty as the spring and summer. Plus, who wants to have a picnic in the rain. Dad told me that Queen Elizabeth Park is one the highest points in the city of Vancouver. That's why people call it Little Mountain, because it's 500 feet tall. According to Dad, Queen Elizabeth Park may even be an extinct volcano. Don't worry, it's not going to blow up while you're on there because the volcano died a long time ago. For some weird reason most grown-ups like looking at gardens. I can't figure it out. What's the big deal about a garden sunken down a hill or a bunch of different coloured roses that smell nice? As Mom says, "Maybe you're not old enough to appreciate the beauty of Queen Elizabeth Park." She's probably right. I need to get married first.